We’ll nestle like a pair of saucers. for life and the small reasons. That’s beautiful. It’s moments like these we live for. Lovely & pure. Very sweet! What a great image too. Thank you. I thought a little sweet would make for a nice change. Some of the best moments in life are contained within those words. Very special Tosha! This is evocative of great nights had. Makes me long for times past. Great none the less. Thank you. I hope you find it again in your future. You’re so lovely. I know you will. You and I both. You are very sweet. Thank you. Have a good night Tosha. Always a pleasure. *sigh*…….. I’m just gonna sit here for a while…..
A very beautiful poem. Most often the small reasons are the most important. 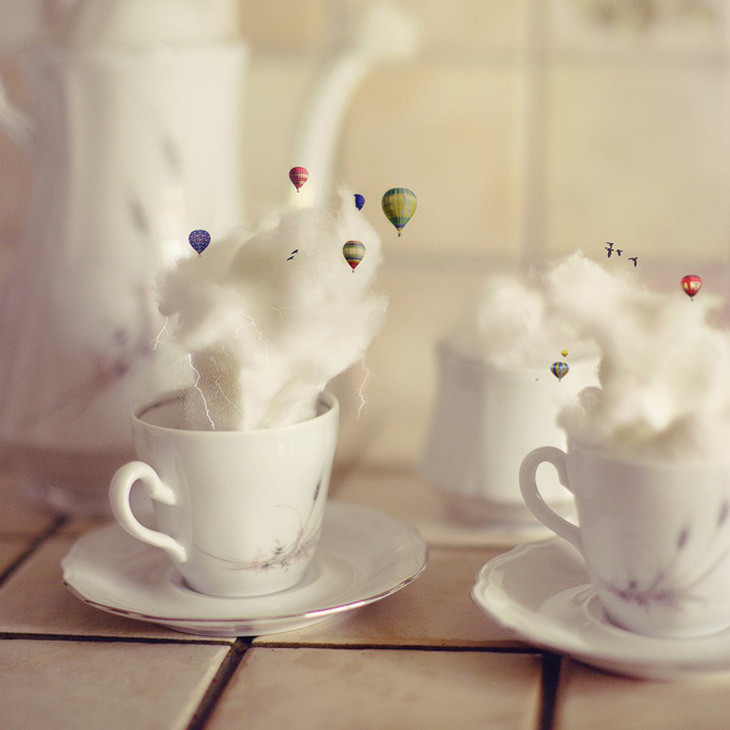 I love the small hot air balloons, the birds seemingly floating in clouds above cups of memories. The music is a perfect compliment of the three. Thank you. No. Thank you, lovely one. All best. Sempre bella musica sul tuo blog Tosha ,ti auguro una dolce giornata. A spooning delight just in time for Valentine’s day. So romantic! Beautiful. Especially loved the nestling like a pair of saucers. Awesome line,. I don’t know whether to sigh or shout WOW!! You, my friend, are a romantic and this poem reflects what every man and woman out there want to have.Simply stunning!! Mmmm, this is such a wonderful description of a perfectly sensual moment. Moments and emotions like this take my breath away…so dreamy. Her poetry is like silk. Go to her spot and wrap yourself in her words. Have a beautiful weekend Tosha. Dedicated to my one & only soulmate, best friend & husband! I can like again!! Whoop! And a yay! Nicely done, my lovely bundle of hell! At least one of your torrid lives is! Stopping in to say ‘beautiful”…the poetry and image! am enjoying catching up on all that I missed! Hope I can be back soon! Hi! I’ve been reading your blog for a while now and finally got the bravery to go ahead and give you a shout out from Houston Tx!